Special Torah Dedication in the Australian Jewish News! Home » IYIM NEWS AND EVENTS » Special Torah Dedication in the Australian Jewish News! IYIM Torah Dedication goes International! 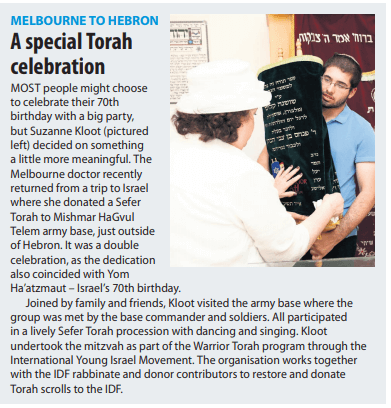 A recent Torah Dedication by the Kloot family, organized by IYIM’s Warrior Torah Program, has been published in the Australian Jewish News! Dr. Kloot recently returned from a trip to Israel where she donated a Sefer Torah to the Mishmar HaGvul Telem army base, just outside of Hebron. It was a double celebration, as the dedication also coincided with Yom HaAtzmaut – Israel’s 70th birthday. IYIM’s Warrior Torah program works together with the IDF Rabbinate and donor contributors to restore and donate Torah scrolls to the IDF.